Much of what Our Lady of Fatima said was revealed soon after her appearances, but the third and final "secret", which was not a message but a prophetic vision seen by the children, was not unveiled by the Vatican until 2000. Pope John Paul II, who read the third secret while recovering from the attempt upon his life in 1981, believed the vision signified the sufferings the Church had endured in the twentieth century. Because of the prophetic nature of her messages, Our Lady of Fatima has been the subject of much controversy and speculation. 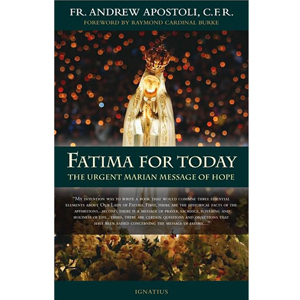 In this book, Father Andrew Apostoli carefully analyzes the events that took place in Fatima and clears up lingering questions and doubts about their meaning. He also challenges the reader to hear anew the call of Our Lady to prayer and sacrifice, for the world is ever in need of generous hearts willing to make reparation for those in danger of losing their way to God. Fatima's Message: What Did Our Lady Mean?